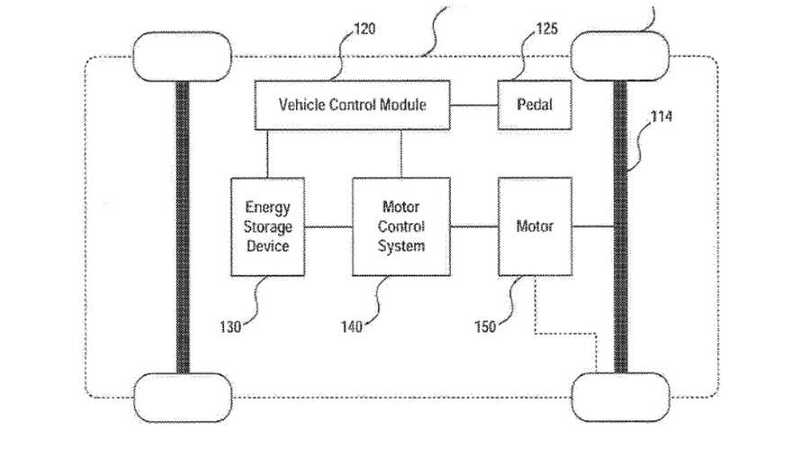 Patent says: "Current research and development efforts on improving the acceleration performance of electric vehicles focus on increasing the output power of the electric motors and the batteries. This approach is similar to the one followed by the R&D community of the gasoline cars, in that an electric motor is often seen as a counterpart of an internal combustion engine and a battery is often seen as a counterpart of a fuel system. The specific properties of the electric motor control system and their relationship with the torque output ability of the motor, however, have not been adequately explored. The present disclosure is directed to improving the motor control system of an electric vehicle to provide additional torque output, thereby further improving the acceleration performance of the electric vehicle." What this might mean: Gas-powered vehicles have had 100 years to evolve into the powerful beasts they are today. Even so, modern electric vehicles are quickly catching up when it comes to performance and driving style. Most EVs easily beat their ICE counterparts in acceleration tests, but Faraday Future thinks that there might be a way to make battery-powered cars even quicker. Instead of simply throwing in a more powerful motor, what if you could drive the motor with an inverter? Could you improve performance that way? Faraday Future wants to find out. 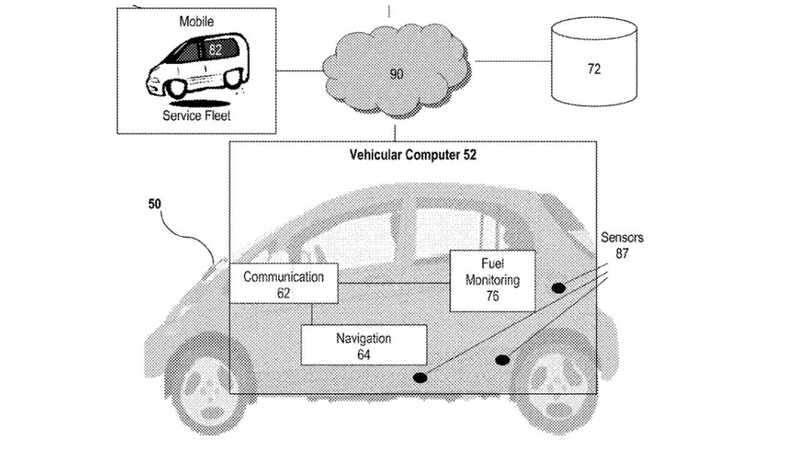 Patent says: "A pro-active mobile refueling service uses a multiple agents and targets solution to assign mobile service agents to re-fuel moving vehicles. A subscription service continually monitors the fuel consumption and fuel reserves of subscribed moving vehicles to predict when a subscribed vehicle will need fuel replenishing." The pro-active mobile refueling service is particularly beneficial for electric vehicles which have limited battery power, as compared to internal combustion vehicles which can run hundreds of miles on one tank of petrol. The pro-active mobile refueling service effectively extends the range of electric vehicles, allowing for worry-free long road trips. The cost savings are significant because it eliminates the need to build a network of fixed battery stations as in the current petrol station paradigm. Instead, a fleet of service agents is dispatched to deliver EV batteries or battery charging when needed. As cool as this all is, we were more impressed with Ford's self-driving, auto-charging EVs from our last patent round-up. Patent says: "A method for controlling the charging of one or more electric vehicles at one or more charging stations in a geographic locality includes determining if the charging event of an electric vehicle of the one or more electric vehicles increases a demand billing rate. The demand billing rate may be a cost per unit of energy in the locality. The method also includes charging the electric vehicle at the charging event such that the demand billing rate is not increased." What this might mean: Charging up a lot of big EV batteries is not an insurmountable challenge for electric utilities, but managing a lot of batteries in a lot of buses does require some thinking. 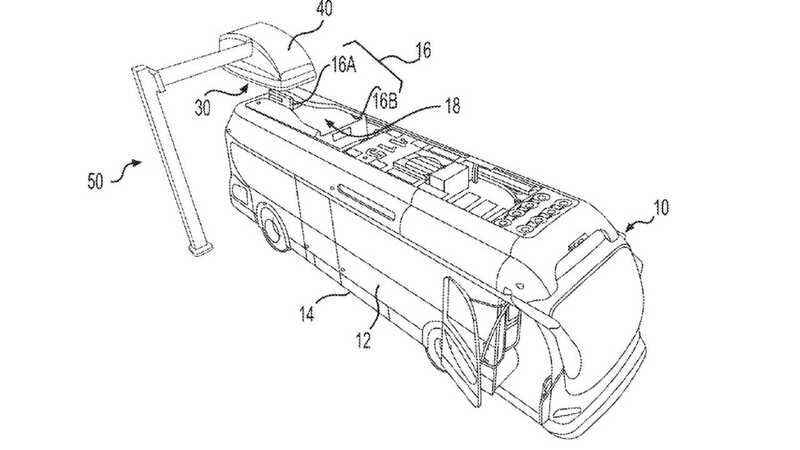 That's where Proterra's patent comes in. The technology described here figures out the maximum amount of energy that can be fed into a number of EVs plugged into charging stations so that the demand billing rate does not increase. With this sort of logic in play, "significant savings may be realized by controlling the charging of the vehicle based on prevailing utility cost," Proterra says.